Up to 60 percent of the adult human body is comprised of water, according to the Journal of Biological Chemistry. Your brain and heart are about 73 percent water; your lungs, about 83 percent, and even your bones are 32 percent water — so H20 is obviously essential to your survival. At all ages and stages of life, your body depends on water, so it should come as no surprise that hydration is key to staying healthy and feeling good. In addition to helping the body build new cells, eliminate waste, keep joints lubricated and much more, water is an important part of a system that keeps fluids and electrolytes—chemicals that help regulate body functions—balanced. If this system is out of wack because there’s not enough water available, you may suffer the dangerous consequences of dehydration, which range from dizziness to loss of consciousness and even death. In the elderly, research shows this regulation system may no longer function correctly on its own, making dehydration more common—and making adequate hydration even more important. 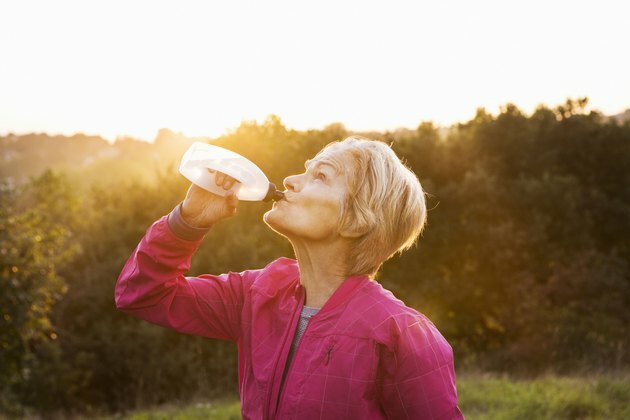 What's more, as you age, the amount of total water in your body decreases as well as your ability to sense thirst, which means dehydration can come on quickly. According to research, symptoms of dehydration in the elderly include dry mouth, no urine or very concentrated urine, sunken eyes, lethargy, low blood pressure, rapid heart rate and dry skin. If you suspect that you're dehydrated, try drinking small, frequent amounts of water. If your symptoms don’t improve, call your doctor or go to the hospital, as severe dehydration can lead to seizure, kidney failure, coma and even death. There's no one recommendation on how much water to drink, despite the old rule to down eight 8-fluid ounces a day. Water needs vary by weight and activity level, along with other liquids and foods you're consuming. Writing in the Harvard Health Letter, university researchers recommend is 30 to 50 ounces, or four to six glasses, of water a day. One major caveat: If you're sick (with vomiting or diarrhea) or active, your hydration needs are going to change. The American College of Sports Medicine advises drinking at least 16- 20 ounces of fluid one to two hours before an outdoor activity. From there, you should drink 6 to 12 ounces of fluid every 10 to 15 minutes that you are outside. Once you're done, you need to replace what you've los by drinking at least another 16 to 24 ounces. Because your ability to sense thirst has weakened with age, focus on drinking small, frequent amounts of fluid throughout the day rather than waiting to feel parched, suggests the National Institute on Aging. Water is the best option for hydration, but any fluids count toward the daily requirement. If you’re drinking juice or soda, try mixing it with half a glass of water to cut down on the sugar and calorie content. Additionally, you can get fluids through foods such as soups, fresh fruits and vegetables, and ice pops.